sometimes, i become, not exactly obsessed, but overly desirous of meeting someone whose photo i have seen or about whom i have read or heard. to date, whenever i have actually met one of these individuals, i have been disappointed. why? because, in my mind, i write all sorts of stories about who they are, and when it turns out, upon meeting them, that all my stories are ... just that ... stories ... it seems like such a let down. these people are usually the sort of people to whom i cannot have regular access ... they don't inhabit my world ... so there isn't an opportunity to get to know them so as to reverse the initial disappointment. it seems so unfair to these people. but, then again, they aren't usually aware of any of this and i never name them to anyone. so there is no personal impact on them. the only loser in all of this ... is me. and, as this post attests, i live to tell the tale. 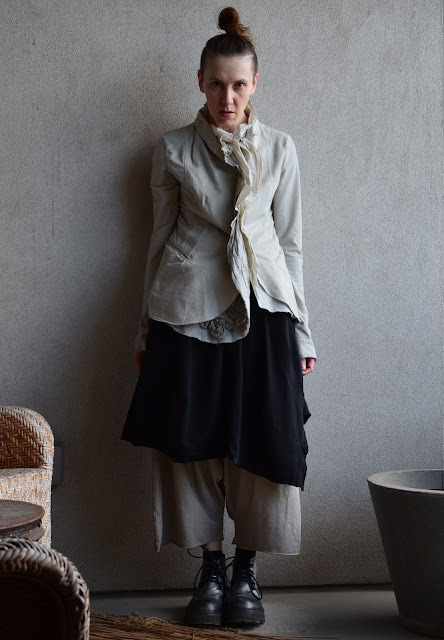 i am wearing rundholz black label s/s 2015 (dress, jacket and trousers), rundholz s/s 2016 (boots).